At last Harvar finds the lair of Aroka. He uses the things he brought with him, and the things he took from the enemies he bested along the way. He uses them to fight the dragon. First Aroka opened its eyes to destroy the mind of Orlanth. 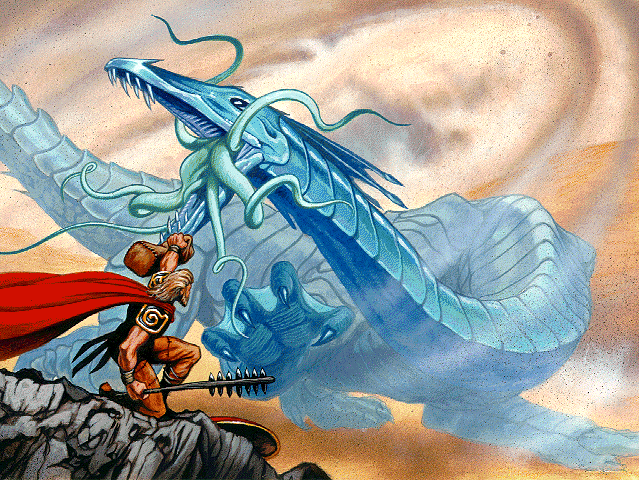 The storm god released the Four Winds and each of them cast its weapon into an eye of the dragon, blinding it. Aroka lashed out with its tounges. Orlanth released the Upper Wind, and this dried up the snaking enemy. Aroka roared out is fatal breath, but Orlanth captured it in the magical Sack of Winds and threw it away. 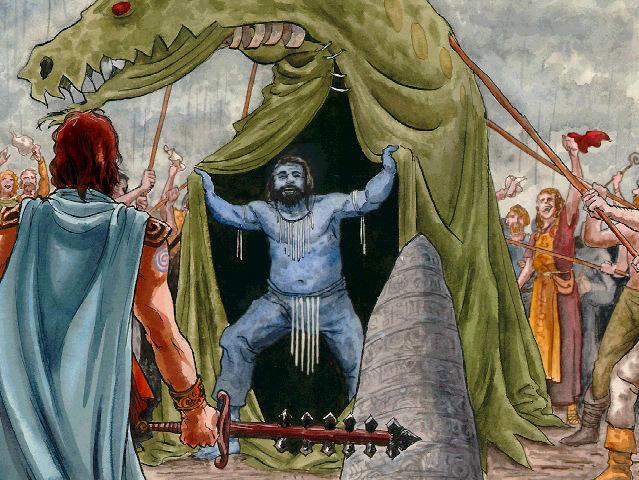 Then Orlanth strode into its mouth and seized the upper jaw with his hands, and placed his foot against its lower jaw, and with a shout of victory tore the dragon asunder. A great flood of blood, water, and mead swept over the land. Inside was Heler, the rain god, who was his friend afterwards. Heler was sent against Daga, and Orlanth went too, pounding the land and covering it with rain. Orlanth captured Daga and put him in a jar. Soon Ernalda was nourishing again, and Drought was banished. Harvar successfully completed the heroquest, and was cheered by all. Harvar brought a number of items back from the place of the gods. Which one do you inspect first? -The bag with Orlanthi runes on it. -The bag with troll runes on it.